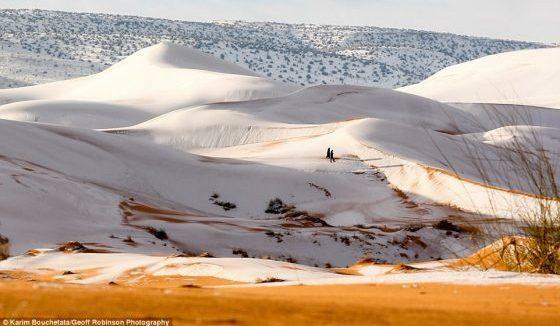 'Global Warming' In The Sahara Desert: "We Woke Up To See Snow!" Residents also awoke to snow in 2016 and 2017. But this time, they got about 16 inches of the white stuff. 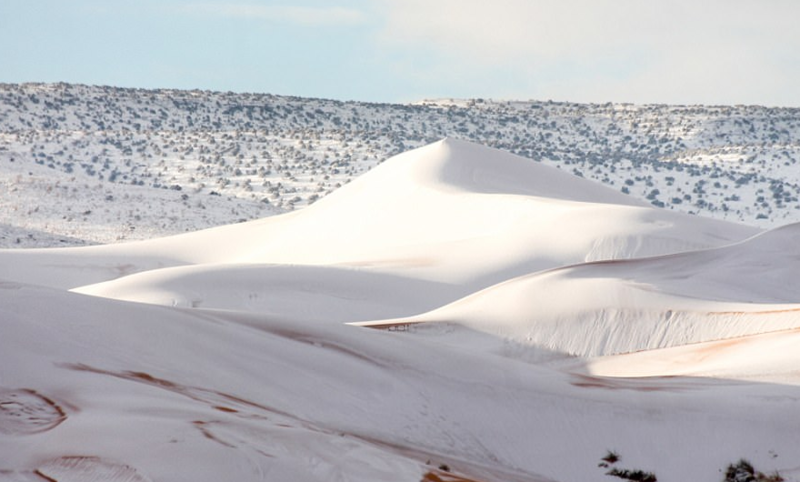 While the actual town of Ain Sefra only saw a few inches of snow, the sand dunes in the desert, which is on the outskirts of the town, were covered. “We were really surprised when we woke up to see snow again. It stayed all day on Sunday and began melting at around 5 pm,” said Photographer Karim Bouchetata. When Bouchetata says “again”, the photographer is referring to another snowstorm not long ago. In 2016, the town known as “The Gateway to the Desert” saw deep snow shortly after Christmas and it caused chaos, with passengers stranded on buses after the roads became slippery and icy. The cold snap comes as Europe and the United States froze in bitter temperatures. Winter Storm Grayson, battering the US east coast, has seen the sea freeze in Cape Cod, along with the Niagara Falls in stunning scenes. “Cold air was pulled down south into North Africa over the weekend as a result of high pressure over Europe,” said a spokesman for the Met Office earlier. Ain Sefra is about 3,281 feet above sea level and surrounded by the Atlas Mountains.